Tungsten rings are becoming ever more popular. However, there still exists a lack of knowledge around tungsten jewelry in general, not just rings, which mean people continue to buy traditional metals, such as gold. There are several advantages and benefits to be enjoyed should you choose tungsten over gold jewelry. Tungsten carbide – an alloy of tungsten and carbon – is one of the strongest and most durable metals in the world. If you have a tungsten wedding ring, for example, you’re not going to need to go to the jewelers for ongoing maintenance because your ring has been damaged or misshapen. When you own a piece of tungsten jewelry, you simply buy it and enjoy it, and don’t have anything else to worry about. Tungsten carbide never loses its shine. At Men’s Tungsten Online, we perform a process called diamond polishing, which gives our tungsten jewelry this characteristic. We’ve all owned or seen people with gold rings that look tired and sorry. 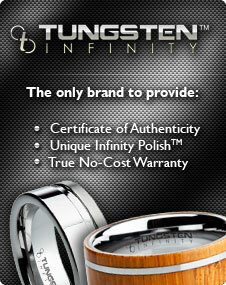 If you wear a tungsten ring instead, it will always sit on your finger and dazzle as if it was new. Yes, you’ll need to complete your own cleaning from time to time just to remove any surface dirt or grime, but you’ll never have to send it off to the jewelers for an extensive clean and re-shine! Having a ring engraved is a great way to add a personal touch to it. Tungsten rings are laser engraved, which gives a much better finish than traditional etching, which you would have if you have a gold ring or another piece of jewelry. On top of everything else, a piece of tungsten jewelry, whether it is a ring or something else, is a truly unique product, and one that will turn heads and get attention everywhere you go. With the benefits and advantages of tungsten jewelry so clear, why would you stick to the boring, traditional metals such as gold in the future?